CSA Interview with star CSA member, Sol. Here is an excerpt from our weekly newsletter that goes out along with our CSA boxes each week. Sol submitted a recipe and our newsletter writer Katie followed up with an interview about Sol and her CSA box! Remember that beyond-yum Pork Pot Pie recipe from last week contributed by a long-standing CSA member, Sol? Lucky for us she was willing to share her food knowledge and a little more this week. We'll let her interview take center-stage. Fogline Correspondent: How long have you been a part of the Fog CSA, and what specifically drew you to it? Sol: I've been a member from the very beginning, so it's been four seasons. Before I joined, I had tasted and was already hooked on the delicious Fogline chicken. I signed up after meeting Johnny and hearing about his CSA. I care a lot about where my food comes from and had been looking to support a local farm. Fogline was the perfect fit. Sol: I look forward to the Padron peppers every summer. They are so delicious simply grilled and tossed with olive oil, sea salt and a squeeze of fresh lemon juice. I like experimenting with everything we get in the basket. I'm still figuring out how to best prepare Celtuce. FC: When did you fall in love with food? What is your favorite style of cooking? Sol: I was introduced to delicious food growing up in a kitchen where my mom prepared fresh, Mediterranean style meals every night. I think I fell in love with food (while) traveling abroad and experiencing the simplicity of fresh ingredients, beautiful outdoor food markets and cultures that revolve around food, family and friends. I love to cook with fresh and seasonal ingredients. I think of my CSA basket and the local farmer's market as my grocery store. I lean towards using olive oil, lots of vegetables, sustainable seafood, lean meats and serving some type of salad at every meal. FC: What are some of your current favorite restaurants/chefs in the Bay Area? Sol: I love Cotogna - incredible food, service and atmosphere. I recently tried La Balena and it's a new favorite. Favorite chefs are Michael Tusk, Brandon Jew, Thomas McNaughton and Charlie Parker (now in LA). FC: What is the one ingredient or pantry staple you cannot do without in your kitchen? We're lucky to have gals like Sol and the rest of our CSA crew, fighting the Good Food fight! CSA Member Cards Have arrived! 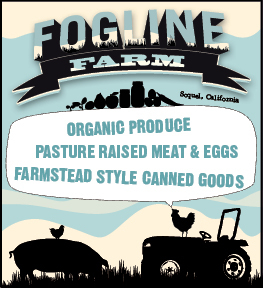 FOGLINE FARM IS A FULLY INTEGRATED ORGANIC FARM LOCATED IN THE SANTA CRUZ MOUNTAINS.